Pinnacles National Park became America’s 59th national park in 2013. 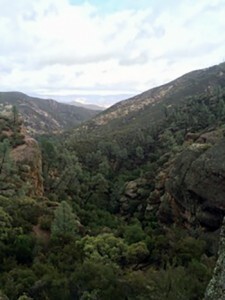 O n Jan. 10, 2013, President Obama signed legislation sponsored by U.S. Rep. Sam Farr and U.S. Sen. Barbara Boxer, re-designating Pinnacles National Monument as Pinnacles National Park. Pinnacles is located near Paicines, Calif, the park is about 125 miles south of San Francisco or 38 miles from nearby Salinas, Calif. It is easily reachable from the San Francisco Bay area for day trips. The area is popular with rock climbers and hikers who love the rock formations of the former volcano site. The volcano was split by the San Andreas Fault, pushing rocks upward and leaving remarkable scenery for today’s visitors. Those not so inclined to climb enjoy photographing the mountain scenery or hiking some of the 30 miles of park trails. The park also offers visitors a chance to explore its two caves. And birdwatchers can visit the park to observe the California condor, North America’s largest bird, flying the park’s skies.